Stroll past high-end designer stores on level four of the swanky Westfield Sydney and you’ll stumble upon The Tea Salon. It’s all very pink and white, with splashes of purple and green creating a truly feminine feel. There’s quite a menu; 10 scone varieties, both sweet and savoury, including a gluten-free option. If a glass of Moet is more your thing then there’s a selection of champagne and other alcoholic beverages to choose from. This is my second visit in two years. During my first visit I tried a cinnamon/raisin scone served with strawberry jam and thick cream, however it was dry with a nasty after taste. My friend ordered the date/orange scone, served with thick cream and a burnt marmalade jam, and wasn’t impressed for much the same reasons as myself. Normally I’m not a fan of marmalade but I actually liked this, as it wasn’t too ‘breakfast marmalade-ish’. Due to recent positive scone reports I decided on a second visit, but this time to taste the plain scones. Not so plain as I taste a hint of lemon or orange zest. The strawberry jam isn’t bad and the double thick cream gives it a fine finish. 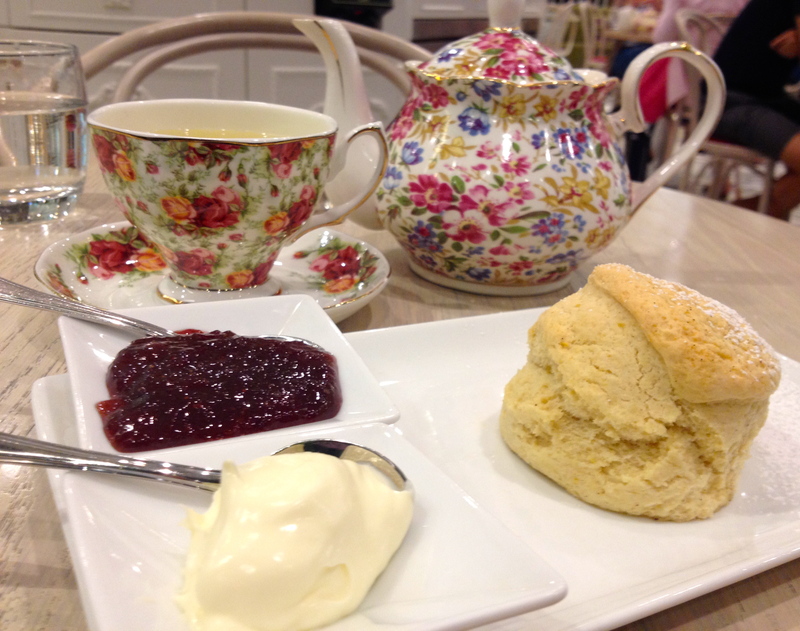 Love the dainty teacups and teapots and if any of the flavoured scones takes your fancy, you can buy take home packs. Tea: A selection of loose-leaf teas including a few herbal varieties. Overall: A chick magnate kinda place.